Weather is defined as the state of the atmosphere at a specific place and time, whereas climate is a long-term average of weather in a region. Many factors combine to create the different climates found throughout the world, such as the amount of solar radiation an area receives, local terrain, nearby large bodies of water, and changing geological and biological conditions. Small changes in Earth's orbital pattern around the Sun also can have major effects on climate. Meteorologists have achieved some success at predicting weather patterns in part because they are of a localized nature and of short duration. Climate, however, takes into account weather factors over a larger region and a longer timespan, and hence is much harder to predict. The primary factor that affects climate is solar radiation. About half of the Sun's energy radiated towards Earth is absorbed, but this energy is not evenly distributed across the surface. Factors that influence absorption are the transparency of the atmosphere, the angle of the Sun above Earth's surface, and the reflectivity of that surface. The world's oceans play a major role in absorbing and releasing solar energy, and providing moisture to the atmosphere. They also absorb huge amounts of carbon dioxide gas from the atmosphere. The angle of the Sun above the horizon, known as the angle of incidence, determines the amount of energy striking Earth. If the angle of incidence is high, as it is in the equatorial region, with the Sun nearly perpendicular to Earth's surface, maximum energy will be spread over a small surface area with little reflection. As the angle of incidence drops, as when nearing the poles, the same amount of energy is spread over a much larger area due to the increased angle. More solar energy is reflected out of Earth's system if it comes in at an angle. The absorption of solar energy is also influenced by Earth's orbital inclination. Because Earth is tilted on its rotational axis 23.5 degrees relative to its orbital plane around the Sun (the ecliptic), middle latitudes of the Northern Hemisphere receive about three times more solar radiation in June than in December. As Earth orbits the Sun, first the Northern Hemisphere, then the Southern Hemisphere is tilted closer to the Sun, creating the seasons. On June 21, the Sun is directly overhead at noon at the Tropic of Cancer. This date is the summer solstice of the Northern Hemisphere. By December 21, southern hemisphere solstice, the Sun is directly over the Tropic of Capricorn at 23.5 degrees south latitude. This uneven solar heating has created climatic regions of the open ocean that run parallel to the lines of latitude. These climatic regions are relatively stable and are only slightly influenced by surface currents. If the heat from the Sun were not redistributed, the poles would be much colder and the equator much hotter than they are. Moving currents of air and ocean water redistribute the heat over Earth. Evaporation of water at the equator adds latent heat of vaporization to the atmosphere. The hot, humid air rises at the equator, forming two circulation cells, one on each side. Figure 1. Atmospheric convection cells and winds on a hypothetical water-covered Earth are arranged in latitudinal bands, although they are modified by the influence of land masses. The Coriolis effect deflects air masses, either to the east (if moving away from the equator) or west (if moving toward the equator). Upwelling occurs at the equator and polar fronts, and downwelling at the poles and in mid-latitudes. effect, deflecting moving fluids to the right in the Northern Hemisphere, and to the left in the Southern Hemisphere. The resulting complications cause each hemisphere to have three atmospheric circulation cells instead of only one. The Hadley cells consist of hot air rising at the equator, becoming cooler and denser with movement upward and poleward, and sinking at about 30 degrees north and south latitude. 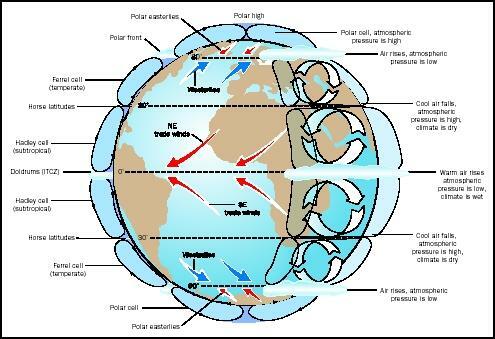 Poleward of the Hadley cells, atmospheric circulation is governed by the Ferrell and Polar circulation cells (see Figure 1). The air rising and sinking at the junctures between these cells governs surface winds and atmospheric pressure across Earth. The equatorial region receives the maximum amount of solar radiation. The warm air is capable of evaporating and storing large amounts of water vapor. The warm air begins to rise, causing weak, variable surface winds, known by sailors as the "doldrums." This moist, rising air cools with altitude , generating rain showers almost daily. Tropical regions extend north and south from the narrow equatorial region to about the Tropic of Cancer and the Tropic of Capricorn, respectively. Figure 2. Equatorial, tropical, subtropical, temperate, subpolar, and polar zones are the result of uneven heating of the Earth's surface. This is the area of trade winds, favored by early sailors where consistent winds maintain the strong equatorial currents. Rising heat and water vapor generate the tropical storms and cyclones for which this region is well known. North and south of the tropics lies a band of hot, dry air known as the subtropical regions. Descending air creates a high-pressure belt with low precipitation, and as in the equatorial region, minimal ocean currents and weak winds. These are the so-called "horse latitudes," where the hot, dry air evaporates the ocean water at an accelerated rate. The temperate regions lie above 40 degrees North and South latitude. The prevailing westerlies dominate this region with strong winds and unstable weather. As on land, this region is well known for storms of great size and intensity, especially when hot, moist air, as in a tropical cyclone, mixes with the cooler air of the temperate region. The subpolar regions have predominately low pressure and areas of high precipitation. Sea-surface temperatures reach a summer high of only 5°C (41°F). This allows sea ice to form during winter months and completely cover the ocean until the spring thaw. The polar regions constantly have high-pressure conditions and very little precipitation. Temperatures rarely rise above freezing and remain below zero most of the year. These regions have the harshest conditions on Earth. Winds seldom cease and the year is divided into six months of light, followed by six months of darkness. Only a few areas in Antarctica briefly escape the lock of the ice. The study of fossil records indicates that Earth's climate has shifted numerous times in the geologic past. Many plant and animal species have evolved and then disappeared throughout Earth's past. Climate change has been suggested as a possible cause for some of these mass extinctions. Climate changes may be caused by several factors: a sudden decrease in amount of available sunlight; variations in Earth's orbit around the Sun; major changes in circulation patterns of the ocean; and changes in the amount of infrared-absorbing greenhouse gases in the atmosphere. The interaction of all these causes, and positive and negative feedbacks among them, make climate predictions very difficult. Evidence additionally confirms that erupting volcanoes (e.g., Krakatoa, Pinatubo) and impacting asteroids have altered Earth's climate by filling the atmosphere with particulate matter. This is seen in the study of terrestrial outcrops of rock, and of core samples from ocean-floor sediments. If solar energy is severely restricted for an extended period, a drastic change in Earth's climate will result. Changes in Earth's orbit may create climate changes. The tilt of the rotation axis oscillates between 22.1 and 24.5 degrees over a 40,000-year period. The shape of the orbit changes between an ellipse and a circle over a 100,000 year span. And this spin axis wobbles with an 11,000-year cycle. Major changes in ocean circulation have important effects on global climate. For example, the geologic closing of the Isthmus of Panama caused a reorganization of currents 4 million years ago. 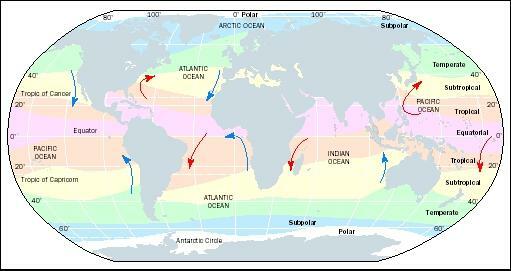 As the Atlantic surface currents pass through the Trade Wind Belt they become saltier by evaporation of water. Instead of moving westward into the Pacific Ocean, the salty water is now blocked by Panama and flows into the North Atlantic. There it is chilled and becomes quite dense, forming the sinking North Atlantic Deep Water that begins the deep-current conveyer belt. If the surface water were fresher, it would be less dense. Instead of sinking, it might flow into polar regions and warm them. Sinking of this water initiated an ice age ; changes in the sinking rate appear to have been closely linked to glacial and interglacial changes in the Northern Hemisphere. During long periods of cooling, snow and ice could not melt as fast as they accumulated. Over time, glaciers began to form and grow, causing weather changes over the huge ice masses covering the poles. Water evaporated from the oceans and was locked up as snow and ice at the higher latitudes. Because Earth holds only a finite amount of water, ocean levels began to drop. At the height of the last glacial age about 18,000 years ago, the oceans may have been as low as 150 meters (500 feet) below their present level. Warming climates would melt glacial ice faster than it was being created, slowly recharging the ocean basins. These periods of interglaciation generally exhibited mild enough conditions to push back the polar glaciers and allow for migration and distribution of both marine and terrestrial species, including humans. Global warming will be a point of research and debate for the foreseeable future. Global warming is part of a natural cycle in the broader climate-change scenario, which is confirmed in the fossil and geologic record. However, human activity has had an impact that, if not causing global warming, is at least helping to accelerate it. Records of atmospheric CO 2 in glacial ice over time show a correlation between high CO 2 content and warming of the global climate. Researchers agree that global warming will produce changes, but do not agree as to what exactly those changes will be or their intensity. An increase in tropical storms, heat waves, and precipitation has been suggested. The rise in global temperatures may influence the ocean's deep-water circulation patterns, which can cause rapid climate change, which in turn would affect the global distribution of plant and animal species. Another possible change would be accelerated melting of the polar ice caps. Water released from the melting ice would cause a rise in sea level, flooding low-lying coastal areas. SEE ALSO Carbon Dioxide in the Ocean and Atmosphere ; El NiÑo and La Niña ; Glaciers, Ice Sheets, and Climate Change ; Global Warming and the Hydrologic Cycle ; Global Warming and the Ocean ; Ice at Sea ; Ocean Currents ; Oceans, Polar ; Oceans, Tropical ; Weather and the Ocean . Ahrens, C. Donald. Essentials of Meteorology, An Invitation to the Atmosphere. Minneapolis/St. Paul, MN: West Publishing Company, 1993. Charlson, Robert J. "The Coupling of Biogeochemical Cycles and Climate: Forcings, Feedbacks, and Responses." In Earth System Science From Biogeochemical Cycles to Global Changes, eds. Michael Jacobson, et al. San Diego, CA: Academic Press, 2000. Stanley, Steven M. "Ocean Circulation: Conveyer of Past and Future Climate." In The Earth Around Us, ed. Jill S. Schneiderman. New York: W.H. Freeman and Company, 2000. National Climatic Data Center. National Oceanic and Atmospheric Administration. <http://lwf.ncdc.noaa.gov/oa/ncdc.html> . Rising air also affects the climate of continents. This is an extremely important piece of information that the website should expand on to the best of its abilities. There are other factors as well, but I believe that this is a verty important one. I understand that it is difficult to keep up a website, but please do your best by adding this information to the list; it will be used by many. The difference in water surface area between the peak of glaciation and the end of an interglacial period can exceed 7%. This difference in evaporative area would have a significant effect on atmospheric water vapor quantity, average cloud cover and average cloud altitude (thus average cloud temperature). This cloud change could be a major contributor in toggling between glaciation and interglacial climates. Has this been considered?